I can't decide which I LOVE more, the name of the new Imaginisce collection or the actual collection itself. Hello Cupcake! I love the rich colors of the collection and all the little elements. I've been playing around with it all week so I thought I'd share two of the many projects I've made so far. The others are still in my head, wishing one of us was having a birthday soon. Whether you're giving a gift for a teacher or celebrating a birthday or any other special event, it's easy to dress up a simple bag. 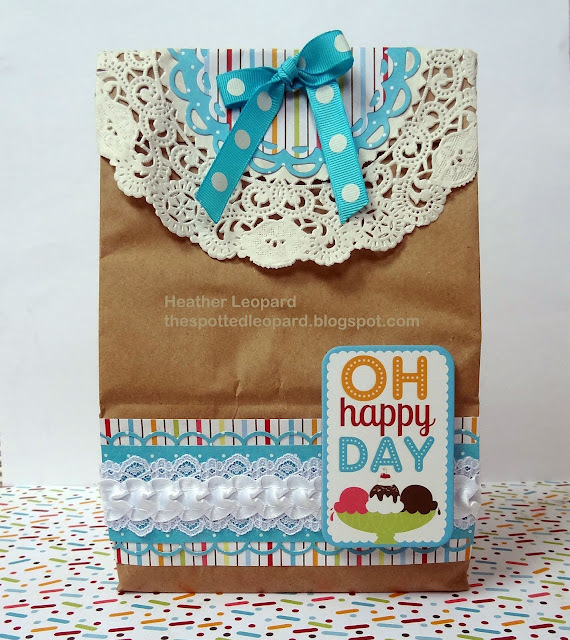 I used a Kraft lunch bag and dolled it up with paper from the Hello Cupcake 6x6 paper pad, doilies, punches, ribbon and lace. This can be used for any occasion and is sure to make someone's day happier! Everybody needs a party hat to celebrate their big day. Try this one on for size! Made with the new Imaginisce Hello Cupcake collection, a bit of trim and a template with step x step instructions available for download further down within this post. The honoree is sure to feel special! My youngest daughter has been wearing this hat all around the house. I think I will have to use the template I created to make other versions of the hat...maybe some princess themed ones with tulle and bling! Or, I was just looking at the hat and I guess you could also use the template to make a teepee. Does it look like a teepee to you? All you'd have to do is change up the color combo and you'd be all set to play cowboys and Indians. I created a free TEMPLATE download so you can make your own. 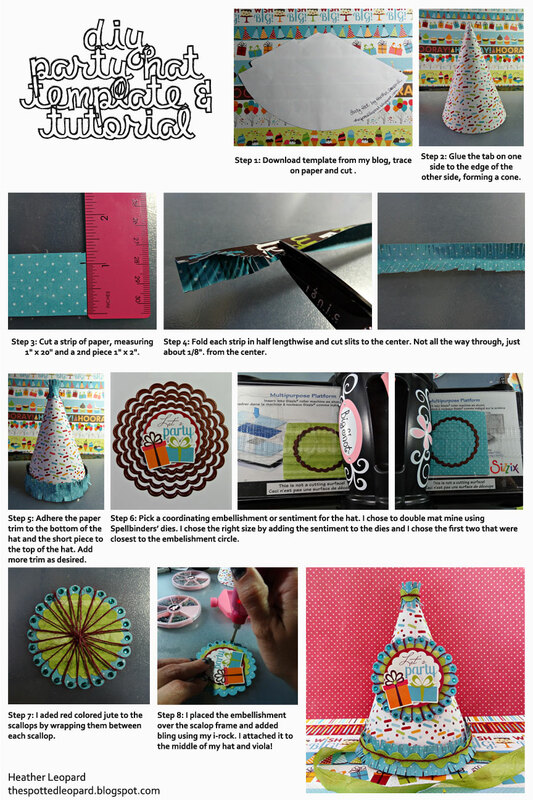 I've also included step x step instructions and photo tutorial for you below. You can see more of my templates and tutorials by clicking the "Tutorials & Downloadables" tab at the top of my blog. I cut out my template and traced it onto the back of a 12x12 paper. I then cut it out of the 12x12 paper and glued the tab on one side to the edge of the other side. Cut a strip of paper, measuring 1" x 20" and a 2nd piece 1" x 2". Fold each strip in half lengthwise and cut slits to the center. Not all the way through, just about 1/8" from the center. Open the paper strips and adhere the longest piece to the bottom of the hat and the short piece to the top of the hat. Tip: align the seam of the paper strip to the seam in the back of the hat. Add additional trim to the hat as desired. Decorate the middle of the hat, if you are so inclined. To make mine, I cut scallop circles from my Spellbinders dies, added some red jute around each scallop as seen below and added the sticker over the top. I then blinged the scallop circle and the gifts. Last but not least, add some ribbon to the hat to help keep it from falling off when you blow out the candles! Thanks for stopping by today. Make sure to head over to the Imaginisce blog to enter for a chance to win a collection of Hello Cupcake! Loveeeeeeeeee the gift bag and that hat is AMAZING!!!! I loveeeeeeee it... and thanks for the tutorial for it! Very fun. Love both projects. I agree with Lisa let's party with a cupcake. Heather, this is so cute! You did an awesome job! Very cute gift bag and hat. How fun. Thank you for the tutorial. Love the hat, and what a great idea for bringing some prettiness to a plan lunch bag. Thanks for sharing. Love the bag and cute hat! I want one for me to wear. Every day. To work. LOL! okay that bag ROCKS! I also loved the little hat--GREAt job Heather! That bag and hat are adorable! What a lovely tutorial! Thanks so much! 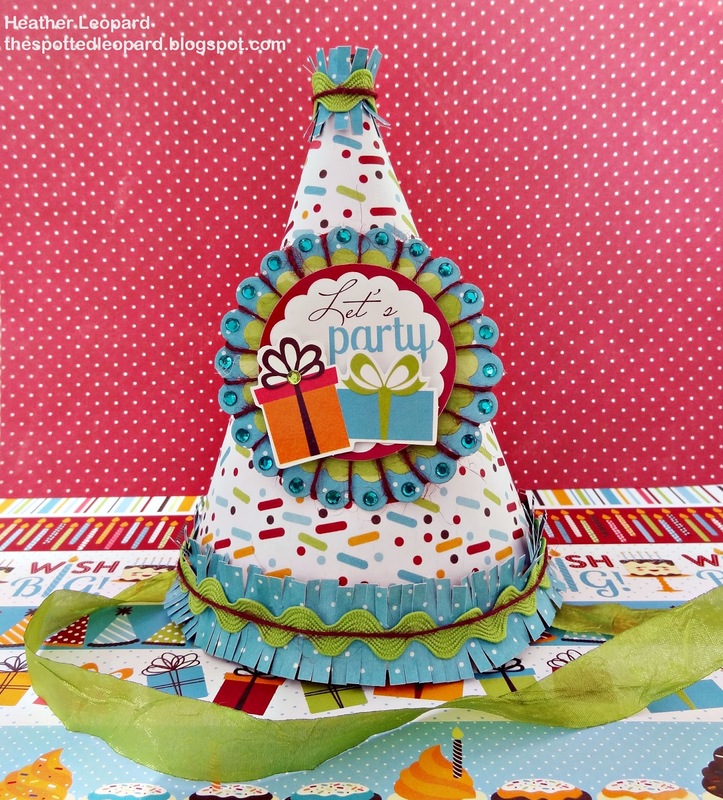 LOVE that party hat...absolutely fabulous! I soooo have to try and make one of these!! I just ''pin it''!! Thanks so much for sharing at The DIY Dreamer.. From Dream To Reality! I can't wait to see what you link up this evening! Awesome! You know how much I love these both--you rocked Hello Cupcake!